My favorite summertime treats, in no particular order: Strawberry Shortcake; Courgette Cake with Lime Curd; Lavender Cookies; Banana Split; Peach Cobbler; Lemon or Orange Cake, with a zesty drizzle. Christine and I discovered Courgette Cake, with Lime Curd, at a sweet little cake place in Tunbridge Wells, Kent. Declaring it the best cake I’ve had in all of England, I set about recreating it. The one we enjoyed was made with a zesty lime curd filling and a light, cream cheese icing. I decided, as the lime curd was both mine and Christine’s favourite part of the cake, I’d give it the starring role and forgo the cream cheese icing entirely. In America, it’s common to make what’s often called “picnic cake,” a cake baked in a single, rectangular Pyrex type pan, rather than the more formal round, double layer number. I tend to make most of my cake this way because I enjoy cutting it into small squares and spooning the curd, or icing, over each one, like a rustic petit four. I adore petit fours, but don’t have the patience to make them. This cake is very moist and light. Not too sweet. Wonderfully transportable for picnics or potlucks. It will take a couple from hours, from start to finish, with plenty of time for resting in between. Prepare pan by lining it with soft butter, followed by a piece of baking (parchment) paper, cut to fit, followed by another layer of soft butter over the paper, followed by a light dusting of flour, shaken about the pan to gently seal everything. Wash courgettes, dry and remove the stems. No need to peel. Grate using hand grater, or food processor. Set aside. Next, in a large bowl, combine eggs, sugar, vanilla, and olive oil. Beat thoroughly until everything is creamy. This takes a couple of minutes with electric mixer. Fold in flour, baking soda and baking powder. Combine thoroughly, scraping sides of bowl. Add most of the courgettes, reserving about 50g/1/2 cup for garnish. Pour batter in prepared pan and bake in hot oven 40 - 45 minutes. Check for doneness by inserting bamboo skewer into center. When it comes out clean, cake is baked through. Remove from oven and allow to cool before cutting. While cake is cooling, gently run a butter knife around the edges to make it easier to remove from pan. I usually make the curd while the cake is baking. If I make it earlier, I risk tasting too much and not having enough to generously top the cake. Timing wise, this seems to work out just about right with the cake. Admittedly, this is the most tedious part of the recipe, but truly worth the effort. I am a big fan of homemade curd, especially lime, or lemon. Juice the limes. I zest the lime by using the finest option on a box grater. Grate only the green part, not the white part which is bitter. Make long zesting strokes, turning the lime as you work, collecting all the fragrant, green shavings. It will take you several limes to collect a couple of tablespoons worth of zest. When you have enough, set aside. Using a heavy, medium size pan, melt butter over low heat. When butter is melted, beat in the eggs. I use a whisk from here on out. Add sugar and blend thoroughly. Add limes juice. Raise heat slightly, a little more than low, a little less than medium, stirring constantly, constantly, constantly, as mixture slowly thickens. After 10 minutes, add lime zest and keep stirring another 5 - 10 minutes. When mixture has enough body to hold to the whisk, or wooden spoon. Remove from heat and allow to cool. It will continue to thicken as it cools. Cut cake into fairly even size squares, in whatever size you desire. Mine are usually three - four dainty bites. Place cake squares on large tray, or platter. Spoon the curd over each piece. 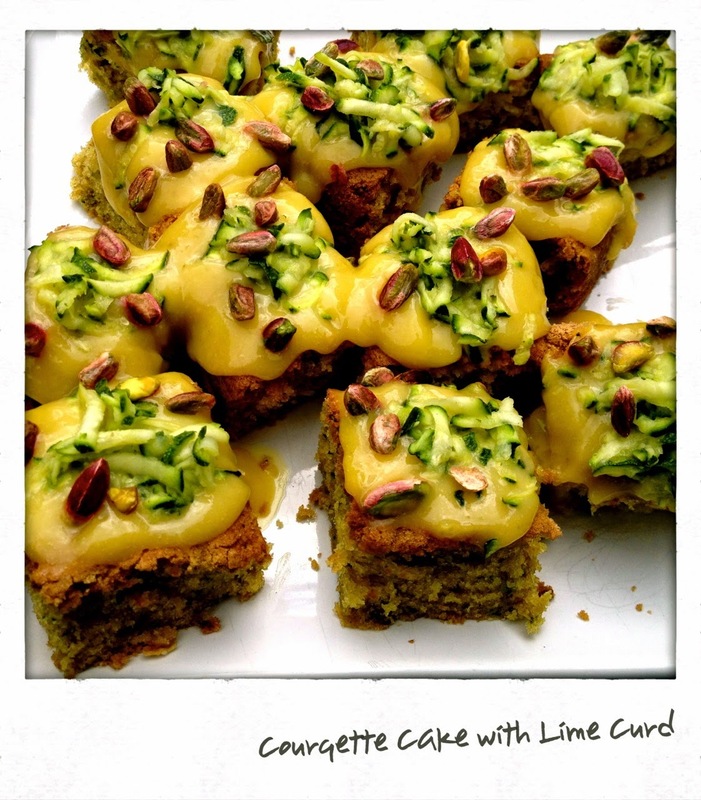 If you’re serving the cake within a few hours, place a few strips of the courgettes on top of each piece. Otherwise, reserve for garnish, as it can make the cake a bit soggy if it sits on it too long. Top cake squares with pistachios. You can either keep the pistachios whole, or crush them. If you have a two tier cake stand, this would be gorgeous served from it, with pot of Lady Grey Tea, or Bloom’s Green Tea with Rose Petals, in the garden. Christine and I discover Courgette Lime Cake at The Cake Shed in Tunbridge Wells, Kent, England.